Race Day Gear: Am I Forgetting Anything? My old friend, runners (New Balance 1060) (worn but not dead yet! 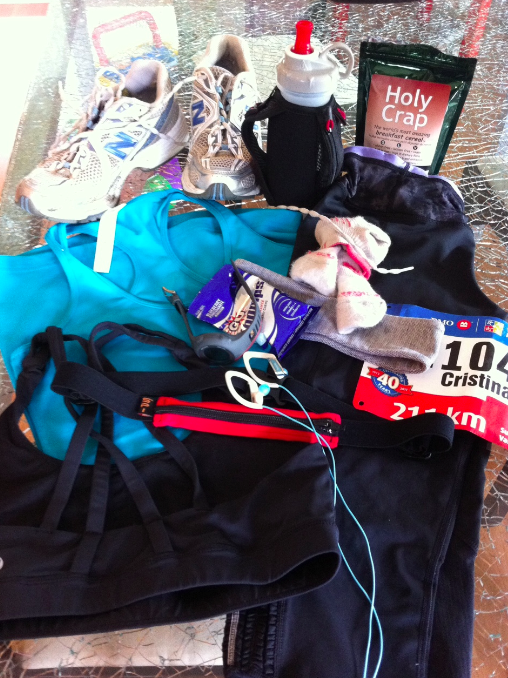 ), hand held water bottle with Brita filtered water, Holy Crap Cereal (Chia seed cereal), Cool Racerback Tank Surge Blue, BMO Vancouver Marathon Race Day Bib and timing chip, Mind Over Matter Crops, Smartwool Socks, Energy Bra, Spi Belt, GU Chomps, Headphones (to go with my iphone), Light Grey Pique Headband (my favourite!). And for after the race my husband is holding my black Havainas Flip-Flops and Rubber Ducky Scuba Hoodie and possibly a great big Starbucks latte and a donut. "Color Comparison **Updated** – Surge Blue, Snorkel Blue and Oasis"
"Spotted! Britney Spears in Lululemon"